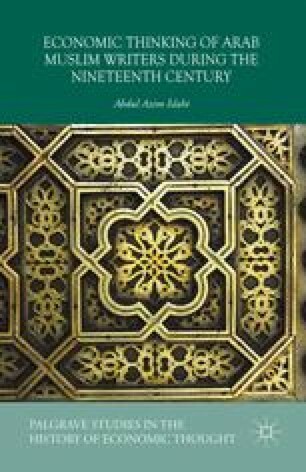 Al-Shawkānī and Ibn ʿĀbidin are among the most distinguished scholars of early nineteenth century Islam. Essentially, they were traditional scholars who had not been exposed to European influence. As against the later generation of scholars, they neither visited foreign countries, nor did they read translations of foreign works. They were therefore unaware of the tremendous developments in politics, economics, the sciences and education that had already taken place in the Western world. Although their works touched upon some economic issues, their treatments nonetheless remained within the jurisprudential framework. In this respect then, they discussed the desirability or otherwise of certain economic institutions on the basis of traditional fiqh rules, which generally did not go into economic reasoning. Both were very brilliant and creative in their own rights, proving themselves to be replicas of the early great scholars of Islamic jurisprudence. However, these two scholars do present extreme contrasts in their works. While al-Shawkani advocated ijtihād and shunned imitation (taqlīd), Ibn Abidin thought that there was no other way than imitation, thereby following earlier jurists who argued that the capacities for successful ijtihād did not exist. Nevertheless, their treatment of economic problems is almost identical.